Manuscriptor is a simple text editing application, designed specially for story and novel writers. Its clean, uncluttered interface allows authors to get on with the important task of writing. 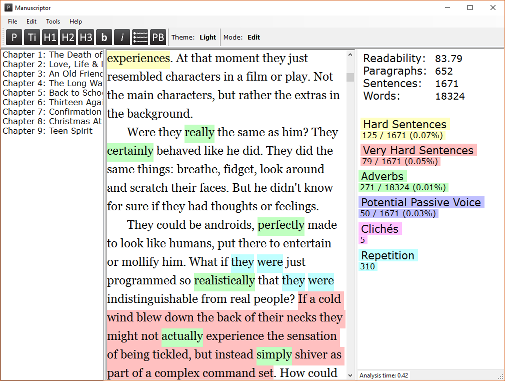 It has responsive language analysis tools that can help improve the quality and readability of prose. The analytical engine identifies and highlights text that could confuse, frustrate or bore a reader, such as wordy sentences and use of the passive voice. The editor also includes indespensible tools such as document overview, spellchecking and synonym suggestions. No need for expensive word processors or web browser diversions. Got a bug, question or suggestion? Please use the contact page.